Posted December 2nd, 2013 by Lisa & filed under 12 Divine Holiday Treats, chocolate, Christmas, Divine Chocolate. Enjoying The Rescue Baker’s 12 “Divine” Holiday Treats? Then, you’ll want to enter for a chance to win a gift set from Divine Chocolate, the premium chocolate brand and Fair Trade social enterprise co-owned by cocoa farmers in Ghana. Divine Chocolate will give away ***THREE*** sets of its After Dinner Thins to lucky fans of The Rescue Baker to celebrate the holiday season. 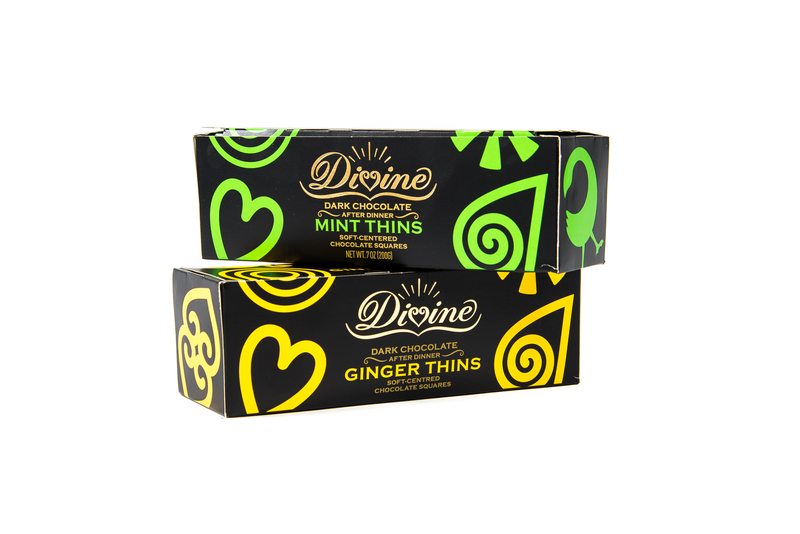 Each gift set contains Divine Dark Chocolate Mint Thins and Divine Dark Chocolate Ginger Thins. Winners will be selected at random and notified by Dec. 15, 2013. Divine Chocolate is responsible for delivery of the gift sets. This giveaway is open to U.S. residents only. Divine Chocolate is the premium chocolate brand and Fair Trade social enterprise co-owned by cocoa farmers in Ghana. At the heart of Divine’s heavenly tasting chocolate is a unique story. Lovingly grown under the shade of the rainforest canopy in Ghana, the cocoa beans used by Divine Chocolate are hand-harvested, slow-fermented and carefully dried by the family farmers of the Kuapa Kokoo Farmers Cooperative, who co-own the company. While Fair Trade ensures farmers receive a better deal for their cocoa and additional income to invest in their community, company ownership gives farmers a share of Divine’s profits and a stronger voice in the cocoa industry. Please visit www.divinechocolate.com to learn more about the Kuapa Kokoo farmers, our commitment to Fair Trade and all the gorgeous chocolate, recipes, stories and people in the Divine world.